Follow Fuller Center for Housing of Central Indiana on Facebook! Dedication of one of the two new homes built on Craven St.
Fuller Center for Housing of Central Indiana just completed building two new homes on Craven Street in Indianapolis for low-income families. Central Indiana Fuller Center partnered with Mt. Pleasant Christian Church, Sacred Heart Catholic Church, and Old Southside Neighborhood Association in the building of the new homes. We are thankful for our sponsors and those that volunteered onthese two homes. If you would like to donate to the Caven Street Project please click on the button below to donate online. Fuller Center for Housing of Central Indiana, Inc., P.O. Box 40475, Indianapolis, IN 46240. Read all about the project in the Concord Neighborhood Newsletter! TO DONATE FOR THE CAVEN STREET PROJECT CLICK HERE! Host to the Millard Fuller Legacy Build 2017-June 2017-we built 5 new homes in the east side of Indianapolis during a 5 day blitz. Volunteers from across the US came to help 5 families work on their homes. 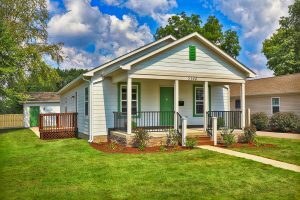 All 5 homes were dedicated on August 5th. Click HERE to see the dedications! Financial support: Please make checks to The Fuller Center of Central Indiana, P.O. Box 40475, Indianapolis, IN 46240. Central Indiana Fuller Center for Housing is a 501(c)(3) nonprofit. All donations are tax-deductible. 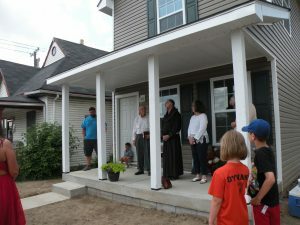 Speedway welcomes family to third community built home. Revisit Fountain Square, site of the 2010 Millard Fuller Legacy Build, in this article. PHOTO ALBUM from the 2015 Bicycle Adventure’s work day with us. Fuller Center’s work in transforming Fountain Square praised in editorial. Putting partnerships to use for families in need. IN THE NEWS: Allison Transmission gearing up for Speedway build. Legacy of hope expands in Indianapolis’ Fountain Square neighborhood. Butler University freshmen work in Fountain Square. “Miracle on St. Paul” continues.